The Grand Loop Road runs in a ovular shape to connect the park's main attractions and has connections to the major U.S. routes coming from Montana and Wyoming. It is directly served by U.S. 14, 16, 20, 89, 191, 212, and 287. The road is undergoing reconstruction in several spots during the summer months over the next several years; contact the National Park Service for more information. Going clockwise, the major attractions with facilities are Grant Village, Old Faithful, Norris, Mammoth Hot Springs, Canyon, and West Thumb. The Grand Loop Road (GLR) has five auxiliary "thumb" routes: the South Entrance Road (leading to U.S. 89-191-287 southbound), the West Entrance Road (leading to U.S. 20 westbound and U.S. 191-287 northbound), the North Entrance Road (leading to U.S. 89 northbound), the Northwest Entrance (Cooke City) Road (leading to U.S. 212 eastbound), and the East Entrance Road (leading to U.S. 14-16-20 eastbound). These thumbs provide direct access to the GLR. Norris Road, the connecting road between Norris Geyser Basin and the Grand Canyon of the Yellowstone River, serves to complete the "figure 8" shape outlined by the GLR. Norris Road provides more direct east-west access across the park. The Yellowstone Grand Loop Road (GLR) was built in 1915, and this changed the look and accessibility of the park forever. During the late 1910s and 1920s, named roads were developed to reach the park, including The Black and Yellow Trail (The National Parks Pike), The Rocky Mountain Highway, The Yellowstone (National Park-to-Park) Highway (see U.S. 20 or U.S. 87 for the two main segments of this route). As visitors increased to Yellowstone due to the increased accessibility from the east and south, the GLR needed upgrades. The GLR was one of the first roads oiled in Wyoming -- the oiled surface was much easier to drive upon than dirt or gravel roads. The GLR was oiled in 1926, while the last major Wyoming road that needed to be oiled was not completed until 1939. The GLR was later paved in the 1940s, and it has since been used and abused without significant repairs. Hence, the road is falling apart within the park. A recent doubling of the fees to enter the park will provide more money to the cause. Park officials hope to appropriate some of this money toward reconstructing of several parts of the GLR, but this is a short-term solution. Since the park's visitation rate has soared, officials are now planning on introducing mass transit (similar to that seen in California's Yosemite National Park). This might include bus lines, shuttles, and even rail lines, including monorails. It is hard to say whether any of these mass transit ideas will come to fruition, but we are talking billions of dollars here. During the winter, the unplowed sections of the GLR was used as a snow machine route for many years, but it was recently curtailed due to environmental concerns. Suffice to say, the short-term solution of fixing the GLR and introducing some busses into the Yellowstone area is about all that will happen for awhile. The Grand Loop Circle is the main road that serves most of Yellowstone's main attractions. Since it is located entirely within a national park, the National Park Service maintains this road and its auxiliary routes (Norris Road and the thumb roads). 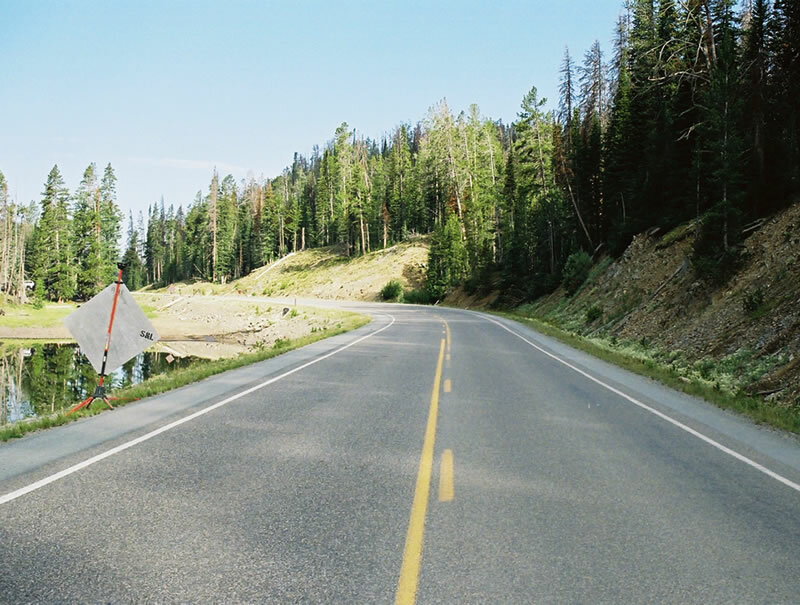 Starting at the Yellowstone Lake Junction at the southern end of the road, the Grand Loop Road (GLR) begins and ends at Grant Village. This facility has a marina and launching ramps for Lake Yellowstone, which is the largest lake at such a high elevation (7,731 feet). West Thumb, which is nearby, features a geyser basin at lake's edge. The GLR continues northwest to climb the Continental Divide -- not once, but twice. 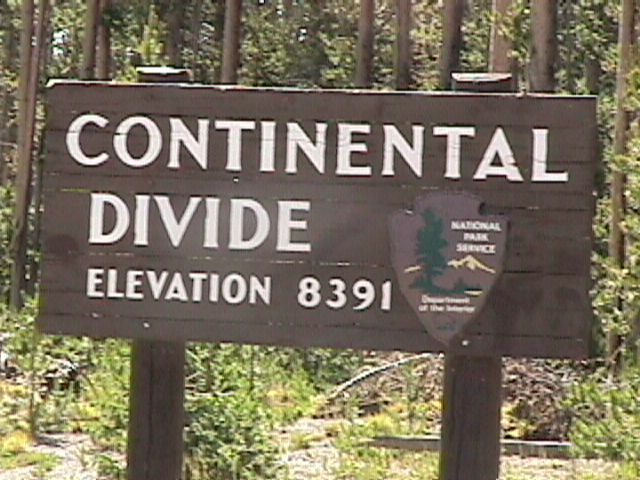 The high point is not at either crest over the divide but rather at a hilltop between the two at 8,525 feet. At Craig Pass, the second crest over the divide, look for Isa Lake. This lake drains to both the Atlantic and Pacific Oceans, with a twist: the lake drains to the west to reach the Atlantic Ocean and to the east to reach the Pacific Ocean. Just beneath Craig Pass, the GLR enters the Upper Geyser Basin, home to Old Faithful. This area was hit rather hard by the 1988 Yellowstone Fires, but much of the plant life is returning in full force. I visited the park for the first time in 1988, so I am acutely aware of the awesome power of fire. My family and I were staying in Canyon, and we decided to take a day trip to see Old Faithful. As we left Canyon Village along Norris Road, the Park Service was closing the road behind us due to the fire conditions. By the time we finished looking at the beautiful hot springs and geysers at Norris, we realized it was late and that we ought to head back to Canyon and see Old Faithful another day. But we couldn't. In fact, the West Entrance Road was also closed, so we were essentially trapped. We ended up at the Old Faithful Lodge. Since people couldn't get into the park to keep their reservations, my family and I were able to get a room (after waiting patiently in the lobby for a few hours). The lodge is simply incredible; it is several stories high, and it is made almost entirely of wood. Our room was on the top floor. After checking out the geyser basin and using the community bathrooms down the hall, we all fell asleep easily. The front desk clerk even gave us toothbrushes since we had no personal effects with us. The next morning, the road was reopened and we were able to return to Canyon. But our stay in the Lodge was unforgettable. We were on the edge of our seat later that summer when the fires went directly into the Old Faithful area and nearly burned the lodge down. Had that happened, we would have lost a truly great national treasure. Heading north on the GLR, the road follows the Firehole River and through the Midway and Lower Geyser Basins. Geysers eject hot water into the river at varying intervals, making the land seem very unfriendly. Boardwalks allow visitors to get close to the geysers without being in much danger. However, the thin crust here makes any travel off the boardwalks unwise. The Norris Geyser Basin is located up the road from the Firehole River geyser basins. The GLR loses U.S. 20, 191, and 287 to the west at Madison Junction. Continuing north to Mammoth Hot Springs, the GLR enters the Yellowstone National Park headquarters. Gardiner, Montana, is located just north of here along U.S. 89, but the GLR turns east toward Cooke City. A petrified tree is located just off the road here; we were profoundly disappointed in it since it was so small and simple compared to the grand geysers located elsewhere on the GLR. Near here, U.S. 212 leaves the GLR toward Billings, while the GLR turns south. Now heading due south, the GLR makes its way to Canyon. My family and I stayed in Canyon our first night in Yellowstone, and it was incredible. There was a moose sitting in a little wooded ditch between two roads, and several buffalo played next to our minivan. They were as big and the car itself, and they galloped along pretty quickly. I was sent by my parents to get the camera to take a picture of the moose in the ditch, but I couldn't get to our cabin without walking through the buffalo. Truly amazing! The Grand Canyon of the Yellowstone, the namesake of the Canyon Village, is located here. Yellowstone National Park got its name from the yellow walls of the Yellowstone River in this canyon. You can hike to the two waterfalls in this canyon. Meeting the East Entrance Road, the GLR turns southwest toward Grant Village/West Thumb. Lake Yellowstone lies to the southeast of the road, and there are several interesting geological and geothermal features ... including the Mud Volcano. Westbound U.S. 14-16-20 end at the East Entrance to Yellowstone National Park. From here, East Entrance Road carries traffic to the Grand Loop Road and all Yellowstone attractions. Photo taken by Alfred Regnery (07/30/2007). Looking west from Sylvan Pass, reflective Sylvan Lake is on the left hand side of the East Entrance Road. This is heading towards the Lake Area. Photo taken by Alfred Regnery (07/30/2007). Now traveling eastbound, this view shows East Entrance Road looking toward Sylvan Pass. This was during the major reconstruction of the pass, so traffic was delayed. 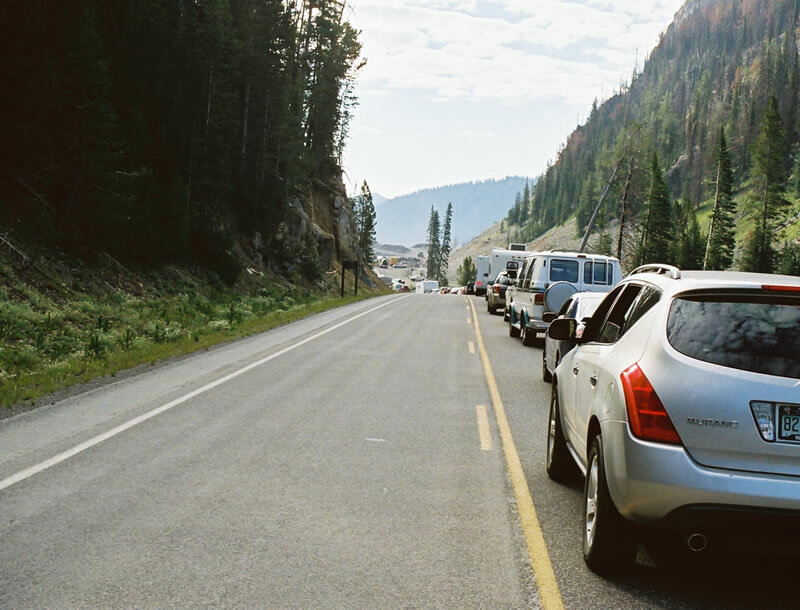 This is part of the 20-year plan to rebuild the Yellowstone Road system. Many of the roads are structurally deficient. Photo taken by Alfred Regnery (07/30/2007). 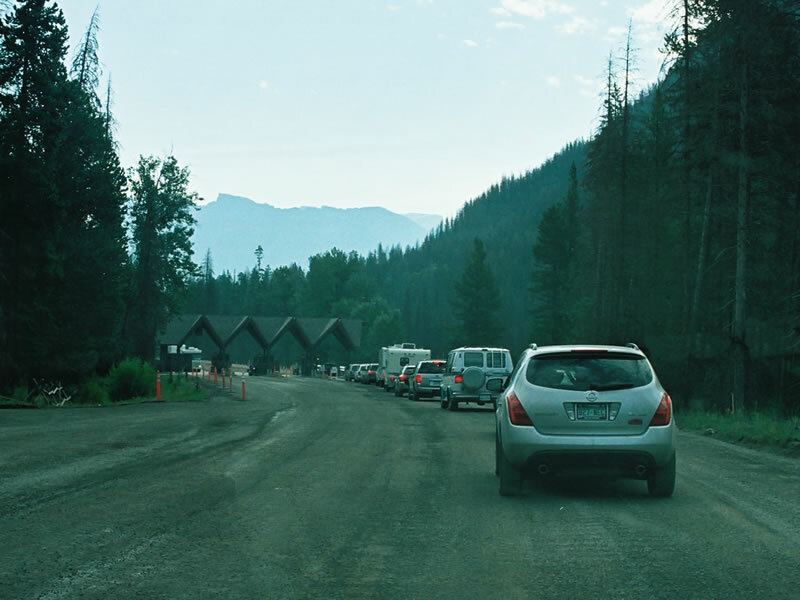 The east entrance station looms as East Entrance Road leaves Yellowstone National Park and transitions onto U.S. 14-16-20 east into Shoshone National Forest. Photo taken by Alfred Regnery (07/30/2007). After passing through the east entrance station, East Entrance Road transitions onto U.S. 14-16-20 east. 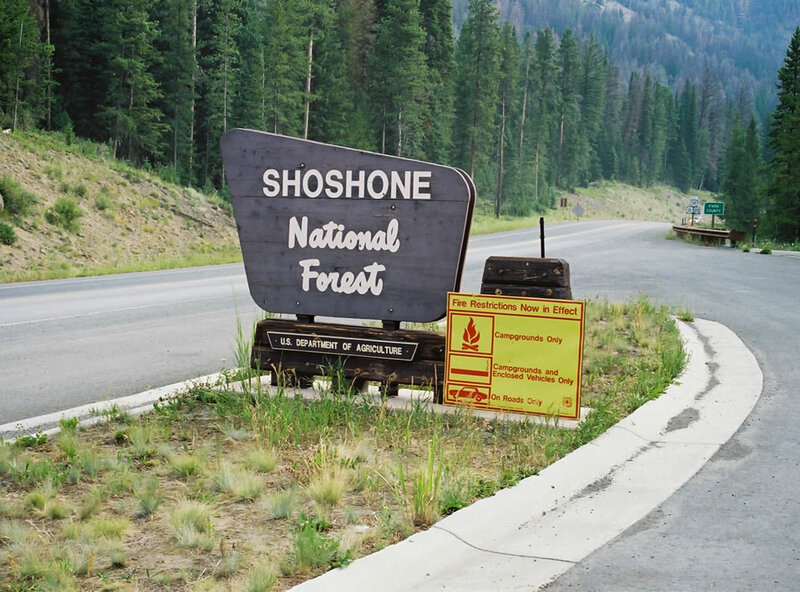 A large Shoshone National Forest sign is placed at the exit, followed by a Park County boundary sign and a shield assembly for the three U.S. highways. 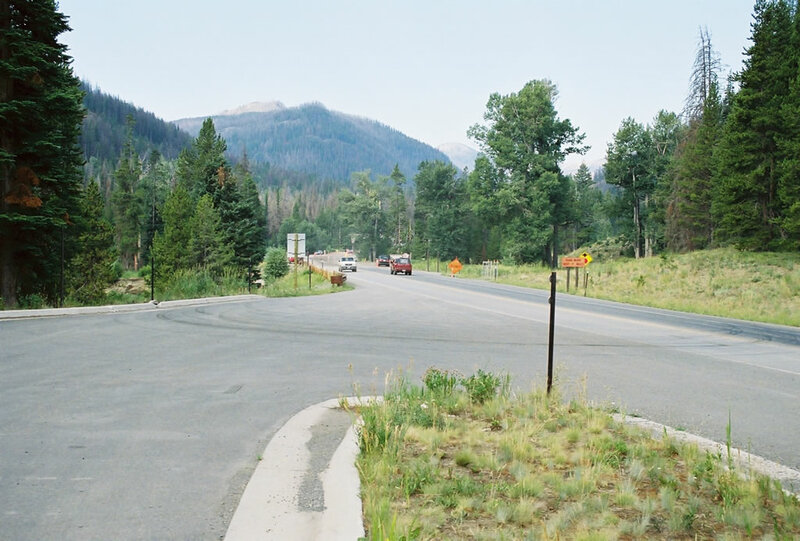 This marks the western terminus of U.S. 14 and U.S. 16 (which are two of three U.S. highways to end in this fashion - U.S. 212 ends at the Yellowstone National Park northeast entrance). U.S. 16 only travels east to Rapid City, South Dakota, since its former route east to Detroit, Michigan, was eliminated. U.S. 14 continues east to Chicago, Illinois, ending at U.S. 41 few miles north of its historic eastern terminus in downtown Chicago near Grant Park. Meanwhile, U.S. 20 continues its transcontinental journey east toward Boston, Massachusetts, after its route break. Photo taken by Alfred Regnery (07/30/2007). Grand Loop Road crosses the Continental Divide at an elevation of 8,391 feet above sea level in Yellowstone National Park near Old Faithful. Photo taken by Jim Teresco 7/25/99. Page Updated November 27, 2007.